We have developed dynamic or traditional packaging systems for Tour Operators who want to merge their carefully planned products such as plane, hotel or cruise and enrich them with auxiliary service products. With this solution that provides an opportunity for online sales, end customers and agencies can look into every kind of demand and combination. Tour Operator Online Reservation program, which we have developed by following the conditions and technologies of the developing market closely, presents a wider sales network for tour operators. It also brings services and products such as plane, hotel, cruise, transfer, trip, travel insurance and car rental together with corporate (B2B) and end (B2C) customers; both separately and collectively. It serves tour operators with a management model that is comprehensive in managing content and makes sure that the products and services are always up to date. TOUR OPERATOR ONLINE RESERVATION SOLUTIONS, which are developed with the latest technologies in the sector, are prepared with the approach of SaaS (Software as a Service – Solution as a Service). This way, our customers can minimize operational costs and receive top-quality service with low costs whenever they want. Thanks to the web-based backoffice, the business we work with can use flight inventories in a fast and reliable manner. With all-around functionality and improved management techniques, they can increase their earnings systematically with solutions of allotment, pricing and flight timetable planning on short and long term. They can easily combine their identified flights with the hotels in the inventory. Our customers have the convenience of determining their hotel inventories in accordance with their daily and periodical needs. Also, the hotel documentation and visual update processes can be controlled via our content management panel that is available for practical use. Web-based backoffice service allows momentary revisions in the background. Our business partners shape their cruise inventories in accordance with their periodical needs. Also, thanks to the "Special Package" solution, they can combine other additional products that provide various conveniences. Our comprehensive CMS management panel controls whether if the cruise visuals are up to date. Web-based backoffice service allows momentary revisions in the background. Our users have the privilege of combining the plane, hotel (or cruise) and transfer (if necessary) services within the inventory. This traditional package solution prices the flights and hotels that have been previously identified to the inventory of our clients as a single product under the "package tour" name. Special Package service plans travelling in a detailed and dynamic manner. Flights, hotels or cruises can be combined with products such as private transfer services, trips at the vacation spot, travel insurance and car rental. This way, services and products are combined into an exclusive product package. With solutions that are in line with the target audience and the desired business models, our customers have the opportunity to make comprehensive and flexible e-commerce. They can conduct their business either by getting into direct contact with the end consumer (B2C) or in the structure of an agency, tour operator or consolidator. As Tursys, we present the wide product range and inventory of the Tour Operator to online travel agencies through GDS and certain distribution channels. We make sure that our customers save time and labor by using a fast and effective method with the Tursys Pool integration. It is very important to reflect each product separately or collectively (package) with a simple and clear management panel by taking product range into account. 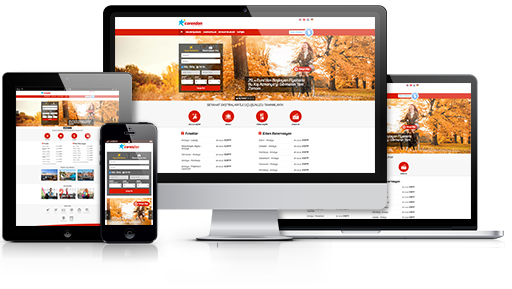 The accounting system that we present in the scope of Tour Operator Online Reservation Solutions can be shaped towards the needs of our customers and integrated to external general accounting systems. Banks and intermediary institutions can be contacted and current payment models can be connected locally and abroad in a fast and reliable manner; the remaining local needs are developed in the light of the proper documentation. We fulfill the needs and demands of our customers by using the latest technology in the web/mobile application architecture and strengthen their businesses with easily manageable and dynamic designs. In parallel with the growth data of our solution partners, we conduct indexing in accordance with the criteria of the search engine and support their usage of social media. The statistics are very important in terms of planning the future of a company. Our programmable, effective and automatic reporting system that is in line with every demand and our capacity of presenting the reports in the desired format make daily work much easier. Reservation status report of the agencies; amount of reservations and guests per agency etc. If you want more information about our solutions, please contact us by filling out the "Request Form" section.